Antibiotic stewardship programs are an integral part of infectious disease management. Such programs have been shown to reduce resource overutilization, costs, drug resistance, and prescribing errors, thereby improving overall quality and value in healthcare.1-4 A similar program designed to help guide cancer treatment has never been described in the medical literature to date. Cancer care makes up a sizable portion of US healthcare expenditures, which continue to increase despite recent reforms. According to CMS, total US healthcare spending in 2014 increased 5.3% from the previous year to $3 trillion.5 The cost of cancer care alone, estimated at $125 billion in 2010 and projected to reach $158 billion by 2020, is a significant contributor to this total.6 This issue is garnering more attention from both the healthcare sector and the public, especially as it relates to the soaring costs of cancer drugs.7 Indeed, Kantarjian et al showed that the average price of new antineoplastic agents doubled from 2003 to 2013, rising from $4500/month to more than $10,000/month.8 These price increases have become difficult to justify because a correlation between the cost of a given cancer drug and its relative benefit, as measured by a number of validated parameters, is often lacking.8 Regrettably, a majority of the cost of cancer treatment often eventually falls on patients and their families, resulting in substantial financial burdens. The concepts of value-based care and cost-consciousness have also become essential to hospitals and health systems as they grapple with the challenges of an evolving reimbursement environment. The importance of these ideas in oncology is illustrated by the rise of the bundled payment and diagnosis-related group systems, which outline reimbursement policies within the context of value and cost. As an example, the setting in which a patient receives cancer treatment usually determines the reimbursement for the institution, with outpatient treatment generally being reimbursed at higher rates. Such policies provide additional incentive for healthcare systems to emphasize outpatient, as opposed to inpatient, cancer care. Despite the many reasons for preferentially giving cancer therapy in the outpatient setting, circumstances do occasionally arise that require inpatient treatment. Perhaps the most common scenario is when a patient experiences a complication or crisis secondary to cancer progression. We hypothesize that, as with antibiotic stewardship programs, there are significant potential benefits to developing an institutional system to monitor and regulate the use of cancer treatments in all clinical settings. Here, we aim to describe our efforts to design and implement a “cancer therapy stewardship program” at our institution and to share lessons learned in order to inform future work in this new and evolving area. Mount Sinai Hospital is a major tertiary care teaching facility and regional referral center with 1171 inpatient beds and National Cancer Institute designation. There are 2 committees in place to work with physicians who treat cancer. The Oncology Pharmacy/Therapeutics Subcommittee reviews requests from providers for the hospital to add certain oncology-related medications to the hospital formulary. The Chemotherapy Council evaluates various cancer treatment regimens and decides whether or not they should be built into our computer-based chemotherapy ordering system to facilitate their use. Both groups are composed of physicians, nurses, and pharmacists. We developed this stewardship program after hypothesizing that adding a layer of oversight specifically for the use of nonformulary or off-label cancer therapies and regimens at our institution may help optimize clinical efficiency and value. Although both of the committees described above peripherally address this issue, their main concerns have to do with the system-wide availability of these therapies, both in the formulary and in the electronic ordering system. Due to myriad anecdotal accounts of unofficial nonformulary requests, we decided it was important to also have a way to review the indications for and evidence behind specific requests on a case-by-case basis to ensure appropriateness. The ultimate goal of this initiative was to promote evidence-based practice and to minimize waste and resource overutilization while improving patient outcomes. We began by performing an exhaustive review of the US National Library of Medicine online database for descriptions of similar projects. We used the keywords chemotherapy, antineoplastic, hematology, and oncology along with the secondary keywords stewardship and control, in all potential combinations. This literature search yielded no results focusing on a stewardship program to help guide and encourage the rational use of evidence-based regimens to treat cancer. A board-certified hematologist-oncologist specializing in hematologic malignancies was designated by the division chair to act as the “steward” and address all requests for use of nonformulary or off-label antineoplastic agents and regimens. All medical staff in the division, including faculty, fellows, and ancillary providers, were directed by the oncology pharmacy to contact the steward by email whenever they attempted to order such medications. The medical team would have to officially submit at least 1 peer-reviewed journal article and their rationale for use to the steward. The steward would then have an academic discussion with the team, as well as with other physicians and pharmacists who made up an informal “stewardship committee,” and then either approve or deny the request. The decision was then communicated via email to supervising oncology pharmacists who would release the drug(s) in question if the request was approved. All requests were collected by the steward over the course of the year in an email folder and then reviewed retrospectively to prepare this report. 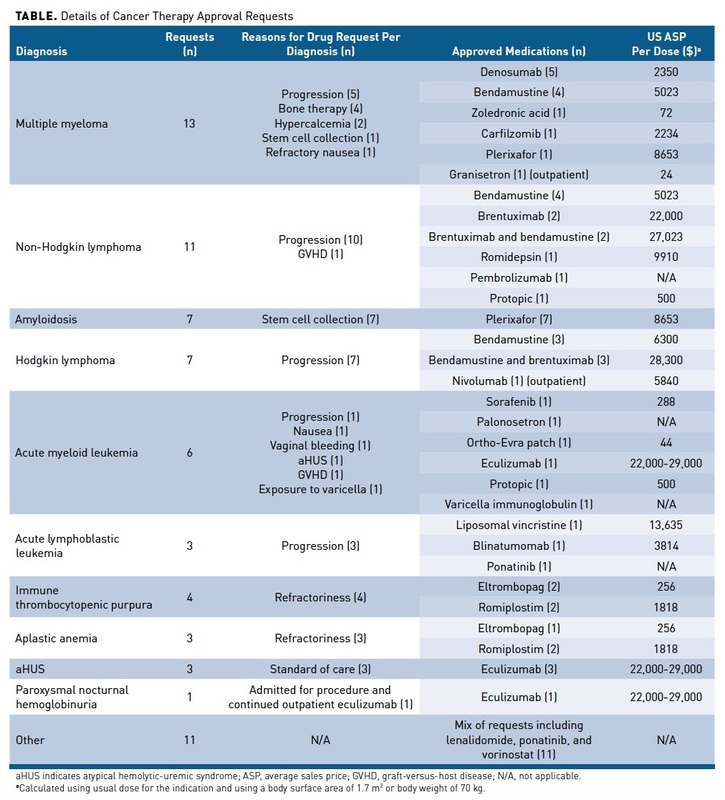 Over the course of 1 year, 67 requests for nonformulary or off-label antineoplastic agents/regimens were made and reviewed by the Cancer Therapy Stewardship Program, as detailed in the Table. These requests came from 23 physicians and pertained to 66 patients. Ninety-seven percent of the requests (n = 65) were for inpatients, whereas the remaining 2 requests were for 1 outpatient. The most common context for these requests was progression of disease, which necessitated inpatient stabilization and management. Upon review, these requests tended to fall into 1 of the following categories: 1) use of a drug in a setting not approved by the FDA (eg, using bendamustine for multiple myeloma), 2) use of multiple drugs in novel combinations not approved by the FDA (eg, combining romidepsin and brentuximab for non-Hodgkin lymphoma), and 3) adding novel drugs to existing FDA-approved regimens (eg, adding daratumumab to a carfilzomib-based regimen for multiple myeloma). The most commonly approved medication was bendamustine (n = 15), either alone or in combination with brentuximab (n = 6), which was the third most commonly requested medication for inpatients. Plerixafor was approved 8 times for inpatients, primarily for stem cell mobilization in patients with amyloidosis. One patient with T-cell lymphoma had multiple requests; he had received bendamustine during an admission for disease progression, then received brentuximab and romidepsin during a second admission for continued progression of disease. The only outpatient requests were nivolumab and granisetron for a patient with progressive Hodgkin lymphoma and uncontrolled nausea who was intolerant of ondansetron. All requests eventually were approved after going through stewardship review. Our experience with piloting this stewardship program yielded many useful insights. For instance, collecting data on prescribing practices gave our department the ability to systematically review and analyze how our physicians dealt with challenging clinical situations in hematologic oncology. The fact that every request was approved helped demonstrate to department leadership that our physicians are attuned to providing optimal evidence-based care. Furthermore, by focusing on nonformulary or off-label agents and regimens, the program also served to highlight novel and experimental approaches to managing complicated diseases for which standard therapies have failed. The stewardship process facilitated discussions among the treatment teams so that everyone involved could work together to pursue better patient outcomes. By encouraging discussion and collaboration, the program also served to promote evidence-based practice and academic exploration at our institution. As an example, we learned that bendamustine, the most commonly requested drug during the study period, was used extensively for cases of multiple myeloma that proved refractory to several prior lines of treatment. These requests were submitted along with 1 of any number of recent studies suggesting improved patient outcomes when using this drug in this setting.11,12 This eventually led to discussions among division leaders regarding the potential inclusion of this medication in the hospital formulary and in the electronic ordering system in order to streamline workflow and increase efficiency. Another important point that this example raised is that the value of certain agents or regimens will invariably change over time as more is learned about each drug and as new and improved drugs come out. Since we began this project, bendamustine has been all but replaced by daratumumab for use in relapsed/refractory multiple myeloma, a fact that highlights the need for regular meetings, perhaps on a yearly basis, to formally evaluate and update the formulary based on new research. This example illustrates the many potential roles and benefits such a stewardship program can have in the realms of patient care, medical education and investigation, and quality improvement. This program also proved to be a useful way to monitor and regulate resource utilization in an effort to help decrease unnecessary spending and contain cost. A key example of this was the use of blinatumomab for patients with relapsed acute lymphoblastic leukemia. Because the average sales price for a 28-day treatment cycle using the FDA-approved dose was $106,800, this agent helped illustrate the importance of such regulation. After a few requests were made to use this medication in this setting, the steward collaborated with the requesting physicians and the pharmacy department to help develop and introduce a change in the way this medication was dispensed and administered by preparing it as a 48-hour infusion. This change, which led to a decreased cost of administration and helped streamline the treatment process, would not have been as easily achieved if such a program for monitoring and review were not in place. A potential critique of this program is that every request ended up being approved, which may call into question its usefulness. However, based on our observations, we believe that the very existence of this program encouraged our physicians to be especially thoughtful in their requests. Because each request was considered only if it was accompanied by supporting data, a thorough literature search was essentially a prerequisite for submission, and so there was likely an element of selection bias involved. In addition, it is impossible to know which requests were considered for submission but ultimately not pursued due to a low likelihood of approval based on a lack of available supporting evidence, although there were several such anecdotal accounts described over the study period. The argument could also be made that our results provide sufficient evidence that this pilot program does not need to continue at our institution. Although this realization itself is informative, as it suggests there is little to improve upon, we would argue for its continuation in order to delve deeper into this issue and try to quantify more concrete outcomes in subsequent studies. Importantly, implementation and maintenance of this program was very simple and did not require any additional financial resources to achieve. Because it essentially formalized a process that already takes place when physicians face challenging clinical situations (ie, reviewing the literature and discussing options with colleagues), it did not require anything extra in terms of resources or time. The pilot program has been completed, and we are in discussions regarding the feasibility of piloting this type of project in the outpatient setting and extending it to other hospitals within our health system. Resource utilization review programs, such as our stewardship initiative, will become increasingly important as the concept of value takes center stage in healthcare. Regulatory agencies and governing bodies have begun to implement programs in which institutions are rewarded for increasing overall healthcare quality within the context of value. Indeed, CMS has been exploring the use of bundled payments for episodes of care as a way to increase quality and coordination of care and simultaneously lower costs. A related new CMS initiative, the Oncology Care Model, invites applicant practices to enter into reimbursement arrangements that include financial and performance accountability for episodes of cancer care.13 Implementing a cancer therapy stewardship program is 1 way cancer centers can begin to adapt to this new healthcare landscape. Aside from its focus on value-based care, this program helped enhance patient care, medical education, and quality improvement. Although we were not able to specifically measure quantitative outcomes in these areas in this pilot study, we believe that this project has laid the groundwork for subsequent work in each of these important realms.